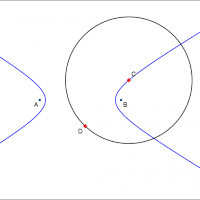 The hyperbola has foci A and B. The family of circles whose center C lies on the hyperbola and which pass through the fixed point D defines an envelope curve. What does this envelope look like when D lies on A or B?